Toon et al. suggest that an impact capable of continent-wide damage requires energy of 10^7 megatons, equivalent to an impact by a 4-km-wide comet . Although an impactor that size typically leaves an obvious large crater, no such late Pleistocene crater has been identified. The lack of a crater may be due to prior fragmentation of a large impactor, thereby producing multiple airbursts or craters. Hypervelocity oblique impact experiments (Peter. H. Shultz , unpublished data) indicate that a low-impedance surface layer, such as an ice sheet, can markedly reduce modification of the underlying substrate if the layer is equal to the projectile’s diameter. These results suggest that if multiple 2-km objects struck the 2-km-thick Laurentide Ice Sheet at 30°, they may have left negligible traces after deglaciation. Thus, lasting evidence may have been limited to enigmatic depressions or disturbances in the Canadian Shield (e.g., under the Great Lakes or Hudson Bay), while producing marginal or no shock effects and dispersing fine debris composed of the impactor, ice-sheet detritus, and the underlying crust. Peter Schultz did hyper velocity impact experiments at NASA’s Vertical Gun Range simulating oblique angle impacts into the ice sheet. In those experiments, the ice is seen to react explosively, like the reactive armor on a battle tank. There was no crater produced. And the scarring is greatly randomized. Dr Shultz’s work indicates that we can expect the ice to explode on impact. So we don’t necessarily expect to find a crater, or any shocked minerals. Because all of the kinetic energy gets translated to heat. 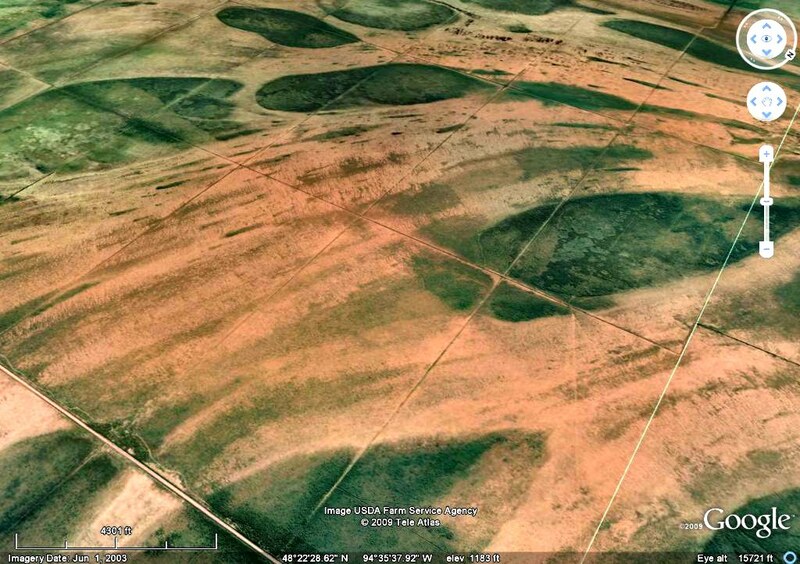 In fact, we aren’t looking for any of the normal features we would expect to find in an impact structure. The ice sheet impacts probably didn’t produce a single crater. But nevertheless, the violence of those impact induced hydro-thermal explosions, and all that inconceivable heat, most certainly would’ve left its mark. And we should expect to be able to identify significant ET chemistry in any melt formations produced by the event. We can use the predicted location in the Archaean bedrock of the Canadian Shield to our advantage for positive clues that can lead us to the impact sites. The region is some of the most stable continental crust on Earth. And with the exception of some dyke swarms that date to about a million years ago, the last time there was any volcanic activity in the Canadian Shield was more than two, and a half billion years ago. That is more than half the age of the Earth. And it is almost too ancient to grasp. But during that time, super continents like Gondwanaland, and Pangaea, have come together, drifted apart, come together again, and drifted apart yet again to become the world we know today. Giant mountain ranges like the Himalayas have been raised up to dizzying heights, crumbled to dust, washed out to sea, and then raised up again too many times to count. Entire ecosystems, the dinosaurs, and countless other species have evolved, flourished successfully for eons, and gone with barely a fossil to remember them by. More than half the age of the Earth is an awfully long time. So any evidence whatsoever of a geologically recent surface melting event is a major red flag. We don’t have to look very far to find our geologically young, surface melt formations. Just northeast of Upper, and Lower Red Lakes, Minnesota we see clearly legible patterns of movement, and flow, in surface melted stone. And the flows are almost in perfect condition. It’s the lighter pink, almost white stone. And it’s the marks of titanic hydrothermal explosions in the ice sheet. The heat source was hot enough to burn all the way down through the ice and partially melt the surface of the stone below. And the story told in the rivers of flowing stone as easy to read as following spilled paint back to the can. Here, the ice seems to have provided enough of a heat sink to quench, and preserve some of the extra terrestrial material that brought all the heat. You see it in the black arrowhead splash of molten material blown off to the side, and framed so nicely by the lighter native rock. The whole region is as level as a parking lot. Drainage is poor. And, for the most part, where you see green in these images you are looking at peat of varying depths. 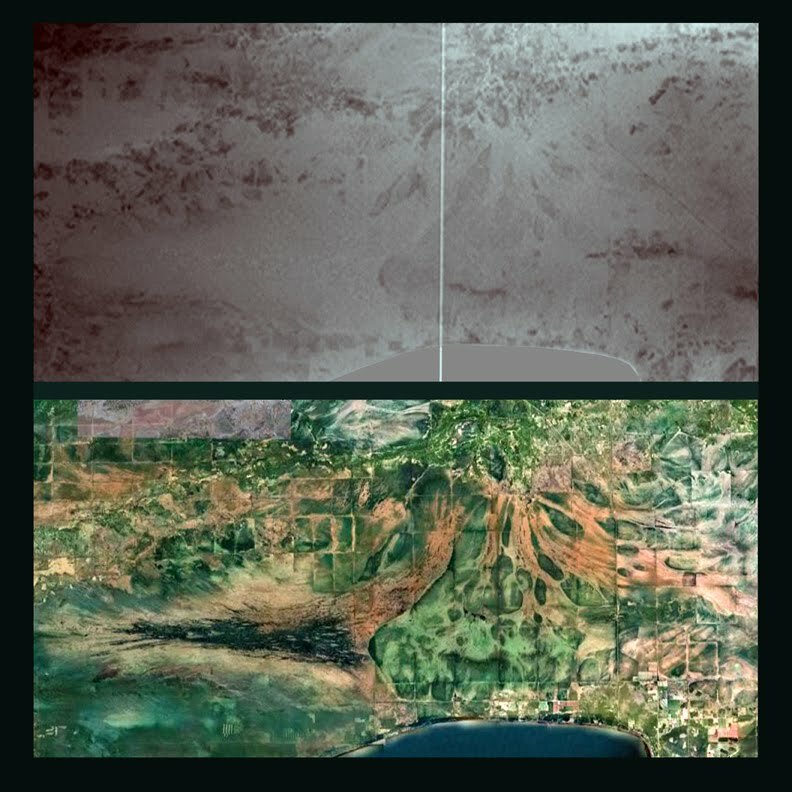 The lines you see in the image maps forming a grid of rectangles are drainage ditches. And the rectangles are 1 mile by 2. Below is a false color radar image depicting elevation. It’s graded from darkest-lowest to lightest-highest elevation. The deference in elevation for the area of the black splash from lowest to highest is only a couple of feet. But the ghostly image of the splash and it’s associated rivers of melted stone show up clearly as raised features in the terrain. 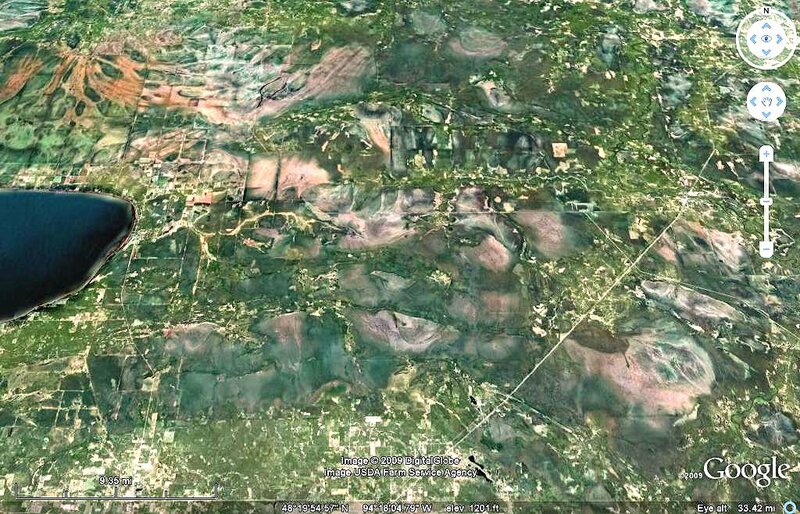 The color of the peat bogs in the area are a good proxy for the contours of the depressions. The darker the green, the deeper the depression. "Para gneiss and schist-rich migmatite -grades into undivided meta sedimentary rocks." Migmatite is a rock of both metamorphic, and igneous, origin that exhibits characteristics of both rock types. Migmatites form under extreme temperature conditions during metamorphism through the heating (but not quite melting) of rocks in the presence of a lot of water. And where partial melting occurs in pre-existing rocks. They aren’t crystallized from a totally molten material, and are not generally the result of solid-state reactions. Migmatites are composed of a new material crystallized from incipient melting, and an old material that resisted melting. Exactly the kind of rock we would expect in the burn scars of comet induced, hydrothermal explosions in the ice sheet. So the full range of temperatures, and conditions we should expect of an impact in the ice sheet, from hydrothermal to pyroclastic, is represented by the rock of the blast burns in the area. But the problem with the words "volcanogenic", and "volcaniclastic", is that there is no volcano there. We are looking at an area of the Canadian shield. The bedrock is Archaean. There hasn’t been any volcanic activity there in 2.5 billion years And, without a volcano, you can’t make a case for volcanism as the heat source for the pyroclasts, and metamorphic facies. Another point to bring up here is that all mass movement on the surface of the Earth requires a motive force. The only examples we’ve had in recorded history of the emplacement of a pyroclastic density current is in an explosive, ‘Plinian’ eruption. The standard model assumes volcanic activity as the source of all clastic rock. And some unrecoverable flaws in that assumption are revealed here. A pyroclastic density current does not move slowly like lava. While in motion, the particles, and fragments, of super heated rock are in atmospheric suspension. And the material is a cloud of fire that’s typically moving at hundreds of miles per hour. Hence, we get the word ‘ignimbrite’, which comes from the Latin for ‘Fire Cloud Rock’. The motive force is provided by gravity as the ash column collapses. There are two critically important components missing if we want to use that model for the formation, and emplacement of these flows. The most glaring is the lack of any volcano whatsoever. This melt could not have come out of the ground. The other problem with the standard model is the lack of slopes to flow down. On level ground, we cannot assume gravity as the motive force for these pyroclastic flows. The heat did not come from below. And without gravity as the motive force, we are left with atmospheric pressure as the motive force. And that pressure didn’t come from below either. Note the the inclusions of black material in the flows of fine grained clastic rock like the inclusions of till in a flowing glacier of ice. It is the fine grained, high carbon, material defined on the list as slate, and graphitic slate. But that stuff was flowing with the melt at the time it was emplaced. And that doesn’t jibe with the well observed explanation for the sedimentary formation of a normal slate deposit. Whatever the inclusions of black, high carbon, material are made of, it isn’t slate. The lines of movement in the melted, flowing stone in the area are clear, and well preserved. Also, they, and the nature of the rocks in the area, are consistent with being the burn marks of tremendous hydrothermal explosions in the ice sheet. They are the grayish to pinkish, sometimes blurry looking areas with flowing lines of once fluid, and moving,’ stone in them. And the number, and spacing of the hydrothermal burns is exactly what we would expect from many pieces of a large, fragmented, comet exploding in the Ice sheet. The lines were formed as the stone was flash melted in the heat of the impact. The Ice added a different variable though. And it took the impact much the same way reactive armor works on a battle tank. Instead of a crater we see the signature of the violence in the fast flowing rivers of melted stone flowing among the shattered remains of the Ice sheet. 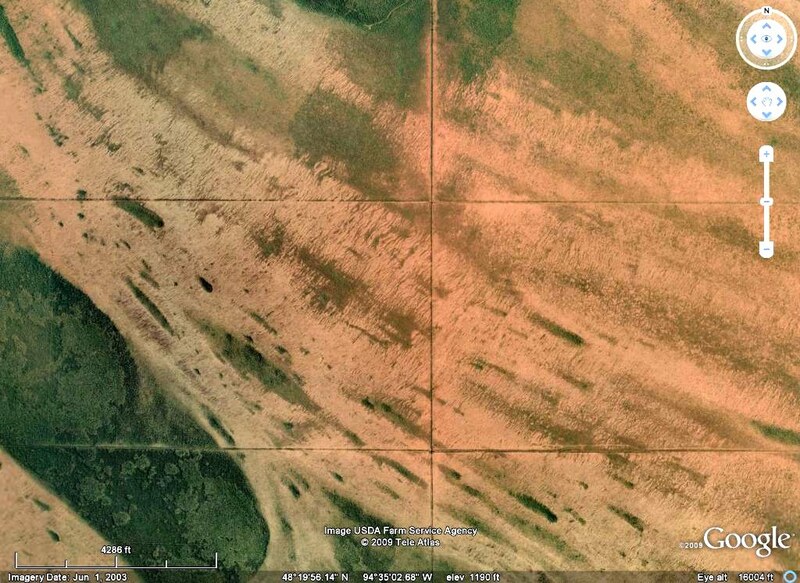 The green peat depressions are the footprints of icebergs. 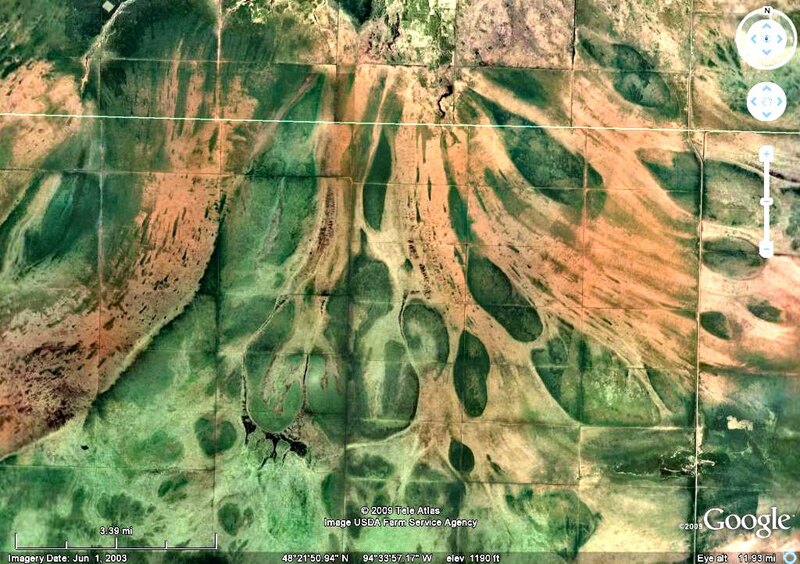 The area is sometimes referred to as "The Patterned Peat Lands of Northern Minnesota". Drainage is poor. And peat bogs are everywhere. But contrary to some of the old literature. The peat didn’t form the patterns. It only conforms to them. And fills in the low spots with green color; the deeper the peat, the darker the green. So in this image map, it’s a good proxy for the contours of the depressions. Most of the old literature on the region focuses a lot of attention in the peat depressions and their possible formation. 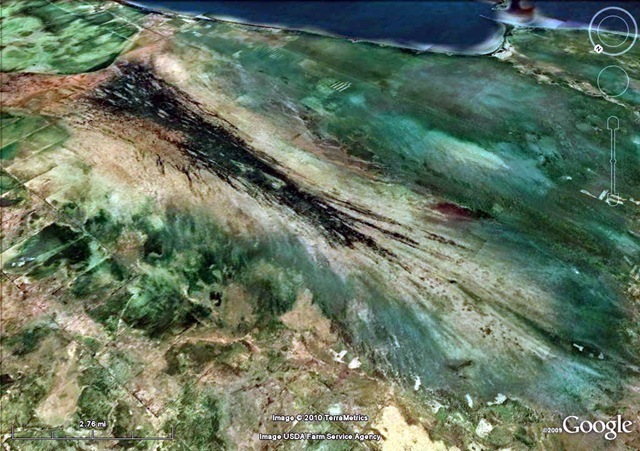 There is speculation that Multiple glaciations caused the patterns. 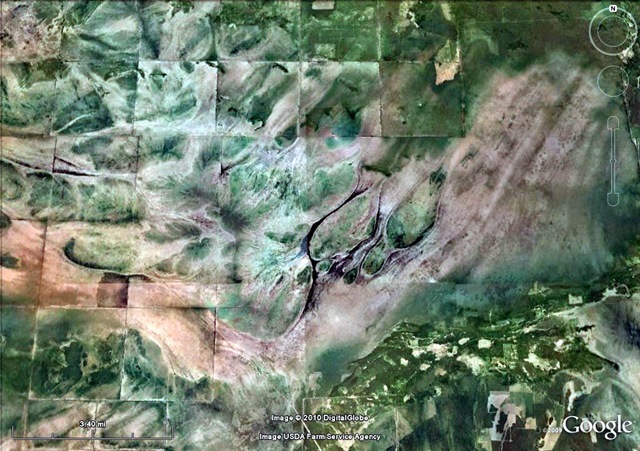 Or Lake Agassiz, and related glacial mega floods may have had something to do with it. But the profoundly simple fact is that ice sheets, and glacial lakes don’t make pyroclasts, or blast melt, or any other melted rock form for that matter. They can only erode away some of the surface detail. And if you look closely you will see that there is no missing surface detail in those melt flows. The solidified melt shows almost no exfoliation, or decomposition. There is no glacial scaring on them at all. And Except for some peat growing here and there in the cracks, and depressions, the melted flows of felsic rock are as pristine as the day they first cooled. And yet the bedrock is Archaean. There hasn’t been any volcanic activity there in more than half the age of the Earth. By its very nature, the fine grained felsic “volcaniclastic” and “volcanogenic” rock on the list was a fluid, in rapid motion at the moment of its emplacement. And here, as in Mexico, those motions are as easy to read as flowing paint. The ice did play a major role here in the formation of these patterns. But not in the manor that has been assumed. The depressions are the footprints of obstacles the melt was flowing around, and through, when it was emplaced. Those obstacles are no longer there because they were icebergs that were the comet blasted remnants of a shattered Laurentide ice sheet. There are only two possible directions to look for enough heat and pressure to melt a few cubic miles of the Earth’s surface. With out any volcanic system to blame we can rule out down. The bedrock is Archaean and a part of the Canadian shield. But the clasts, and "volcanogenic" rock are a surface melt formation. And, to best of my knowledge, the age since melt, of the rocks in question has never really been tested. But I don’t believe for a minute that those pristine surface melt formations date back 2.5 billion years. Do you? Like most other clastic flow materials, they were moving rapidly. And they solidified suddenly almost in mid flow. Those lines of movement are a snapshot in time. And they are an accurate record of the motions of the flows during their last moments in a fluid state. So it goes to fluid mechanics, and becomes a detailed study in the fluid motions of an atmospheric pressure-driven pyroclastic density current. You couldn’t ask for a more complete, and honest data set. And every last detail of it’s its story is permanently, and faithfully etched in the lines of movement in the rivers of melted, and flowing, stone. The lines of flow in an unconstrained, pressure-driven, fluid are always away from the driving force. Even if the fluid is melted stone being driven among fragments of ice. The lines of flow describe the lines of force. The lines of force describe the force itself. And, like iron filings on a piece of paper can describe the fields of a magnet below, the lines of movement, and flow, in pyroclastic materials that solidified suddenly, in mid flow, from a fluid, and driven, state, can be used to accurately describe something of the the energies, and directionality, of the forces that melted, and moved them. You can easily follow the lines of flow back to the source of heat, and pressure, every time. And you can learn a quite bit about that heat source as you do. The surface rock of the blast burns grades from migmatites, which were formed from ordinary sedimentary deposits that were heated almost to the melting point under terrific heat, and pressure. And in the presence of a lot of water. To "volcaniclastic" rock which was probably the same stuff. But heated all the way to a fast flowing state, and fluffed up a bit with hot gasses. And finally, to the completely melted "volcanogenic" rock whose chemistry seems to say it originated from somewhere else. So in the recipes, and conditions, needed for the formation of the rocks of each of the blast burns we see the signatures of the full range of conditions and temperatures from hydrothermal to "volcanogenic", we should expect in the planetary scaring of an ice sheet impact. Those materials, in context with each other they way they are, and without a volcanic vent to blame for the heat. And the patterns of movement, and heat flow, in the melted, and semi melted, rock describe a giant, multiple, hydrothermal explosive event in the ice sheet that was different, and more powerful, and violent, than anything ever studied before. And, without a volcano to blame, we have to acknowledge that the heat that made it all happen didn’t come out of the ground. The hydrothermal blast burns extend well up into Canada. Together they account for enough violence to put most of the eastern end of the Laurentide ice sheet into the north Atlantic in just a few short minutes. They also give a fair accounting of the Carolina Bays too. Because if we work from the postulate that they were caused by impactites from the ice sheet explosions, and we draw a line through the long axis of any of them, that line will be seen to cross one, or more of the hydrothermal blast burns in the Great Lakes region. The hypothesis that the CB’s were caused by impactites of ice is consistent with materials found in the bottoms of the bays. And it provides a good explanation for why no fragments of a bolide have ever been found in one of them. In the flowing lines of the hydrothermal blast melt we see a proxy map for the turbulent conditions they formed in. Yet there is flow depicted. From what I know of flowing viscous fluids, to be thin – which the flatness of the area indicates – the flow had to have a VERY low viscosity. 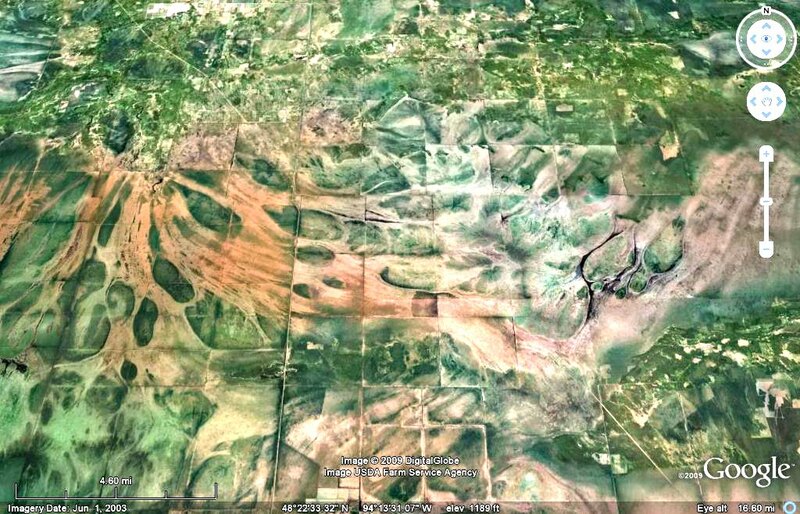 For example, Mexico has a large volcano field across a large area between Guadalajara and Morelia, and another area west and south of Guadalajara. The lava there – and even extending to the Pacific coast from Manzanillo to nearly Puerto Vallarta. I’ve seen this lave, and it was obviously viscous, as it everywhere forms individual chunks and literally mounds of them piled into hills. But don’t take that to mean that I see volcanic flow at this site in MN – I am only talking of how low and high viscosity flows appear. This pattern is completely opposite of that thick lava. If it was even moderately viscous, IMHO, the flows could not have ended up flat like a parking lot. If we think in terms of pancake or crépe dough, the more water one adds, the runnier the dough becomes. Now ask how “thin” the dough has to be to flow out and become flat. Crépe dough is VERY runny, as opposed to pancake dough, even. To get a really thin crépe, a very thin dough is a must. So I would have to ask about your talking about the rock only being partially melted. Partially melted does not have the capacity to flow out that flat. There would be at least a hump to the flow pattern. Perhaps it is there and GE just can’t quite display it well enough. Another issue I would suggest is that the ice turning to water in this area would not have stopped at water. I think most of it would have turned to steam, within several hundred feet or a few thousand feet. I can’t see the energy – especially hitting the Canadian Shield which appears to not have given an inch. In mechanics, the force equivalent of an impact is inversely proportional to the TIME it takes for the impactor to decelerate to zero – the shorter the time, the higher the equivalent (or average) force. If the ground had yielded more, the time element is increased, thus the average force is lower. But this rock gave almost not at all. The ice did yield, but the rock did not – and yet the rock still melted! What the velocity was by the time the impactor hit the rock after blasting through the ice can be calculated, given some assumptions (but I don’t know if I can do that well; I am more than a bit rusty on that stuff). The ice was the thing. Two miles of ice – and yet there was enough kinetic energy left to melt the bedrock to a thin consistency. The ice would have exploded. It would have acted like water dropped into an ultra-hot pan of cooking oil, only WAY more so. The crackling when we fry things comes from the water in the food making small explosions. Take that, raise the whole “recipe” to tens of thousands of degrees – instantly – and imagine the force of the steam. The ash coming out of volcanoes did not start out as powdery ash. Until the instant it escaped the volcano, it was liquid, molten rock. The sudden release of pressure allowed the water in it to expand explosively into steam, and the explosions pulverize the magma as it also cools (as it rises). But on an impact onto and through an ice sheet would have exploded the ice directly into steam, which would have had exploding velocity of probably a couple of thousand miles per hour. The steam would have been doing everything it could do to get away. It would not have tended to stay around. The kinetic energy is not going quite as much into destroying the impactor itself. This is because it takes a finite time to pass through the ice and reach the rock below. The heat generated would NOT have been as hot as if it hit the ground directly. My engineering instinct says it would have been more like an oceanic impact than a ground impact – until it reached the rock below. But by the time it did, at least three things would have happened. It would have had time to heat up. It would have broken up – likely into tiny shredded fragments. It would have slowed down a LOT. 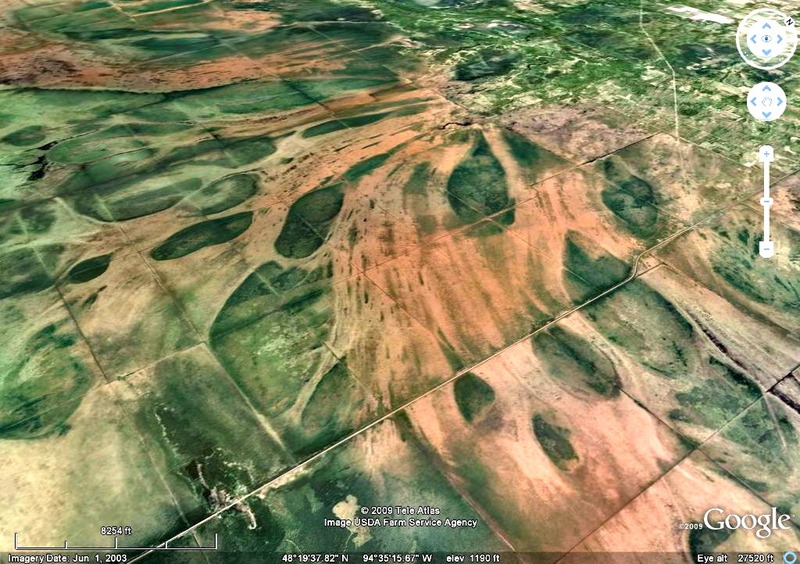 I wonder if – I am almost sure of this – some of the flow pattern isn’t from the material from the impactor. THAT should be checked out. Now THAT is an interesting surmise. Perhaps it is not the Canadian Shield rock we see there. Or it may be a mixture of the two. An aside: Vapor deposition. Look it up. High-speed impingement used to harden the surface of metals. Normal hardness is limited for steels to about 60 on the Rockwell “C” Scale, which is pretty damned hard. Titanium Nitride vapor deposition can achieve hardnesses over 70. It literally embeds the TiN molecules into the steel surface. One last thing: Laminar flow vs turbulent flow. The flow patterns show very little turbulence. That means they were not flowing very fast – fast enough to spread out very flat, but not so fast the flow became turbulent. That may add to the argument that the flow is the impactor material: It would have very conceivably been melted by the time it made it through the ice. That would mean the deposition would have been of molten material, not small particles. Google Pete Shultz’s hyper velocity impact experiments at NASA’s Vertical Gun Range. He showed that a high velocity object could hit an ice sheet and leave no crater at all. You’re right about the ice exploding. It goes off like reactive armor on a battle tank. But ‘no crater’ doesn’t mean ‘no scarring’. It means the marks get randomized. This is where the Noachian flood comes into it. All that steam in the atmosphere would have taken weeks to precipitate back out in the form of rain. Forty days, and forty nights sounds about right to me. A Neolithic Comet by William Napier.